Timber, concrete, gib and all associated building waste removed instantly for a cleaner and safer working environment. Our experienced crew can make the most unpleasant or arduous clean-up jobs a breeze for you. We are efficient, reliable and punctual, and can take the stress out of tidying up after a big construction or renovation job. 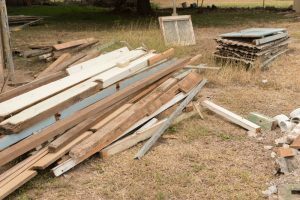 As well as construction debris, we can remove demolition materials, including gib board, roofing, wooden framing, bricks, concrete blocks, insulation material, packaging and general rubble. We will give the place a good sweep up afterwards to leave the area tidy. Our team can also come and clear away rubbish at various stages of a building project. This ensures that waste materials don’t accumulate too much and get in your way while you work. Call us today on 0800 DUMP ME to find out more about our service and competitive pricing. We can give you a price estimate over the phone or send someone out for an onsite, no obligation quote. If possible, we recommend keeping different types of rubbish in separate piles, to save time sorting. For example wood, insulation material, concrete, gib. But if you can’t, that’s not a problem – we can take it away and sort it ourselves. We do this to separate the materials that can go into clean fill instead of landfill, and those that can be recycled or reused. You might be surprised at the amount of waste that can be redirected from clogging up limited landfill space and usefully recycled. We manage rubbish removal and disposal in a way that reduces harm to the environment and mitigates future waste management problems for our city. We provide construction waste disposal for various sized operations, from large commercial construction sites to DIY home renovations. Give us a call on 0800 DUMP ME (0800 386 763) to enquire about our services – our staff will be happy to help. We are available seven days a week, and can sometimes provide same day service, depending on availability.